PLEASE ALLOW A FEW DAYS BEFORE SHIPPING. VISE "IT" (INTERCHANGEABLE THUMB) HAS ARRIVED! FINALLY AN INTERCHANGEABLE THUMB THAT CAN EASILY BE SWITCHED FROM ONE BALL TO ANOTHER WITHOUT WORRYING ABOUT TABS BREAKING OR MOVEMENT IN THE THUMB HOLE! Remove and interchange thumb inserts from one ball to another for the same fit and feel on every shot! 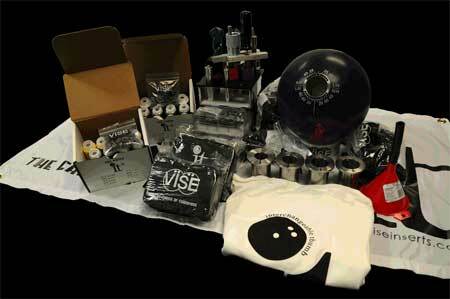 "The VISE Interchangeable Thumb allows me to have the same feel in every bowling ball I own. It is totally secure so I can bowl with confidence, plus I can quickly move it to another ball without any tools. I am using "it", you should too!" "IT" STARTER PACKAGE FOR 1-1/4" & 1-3/8"